This example shows a human figure that is, or should be, self-evidently as of the very highest quality as regarding the ‘veracity of resemblance' of such a motif. Indeed, in my opinion it is well nigh perfect in this aspect, with the only real aspect of ‘compromise' being at the end of the hair, whereby it ends in a somewhat unnatural position. However, this minor quibble aside, the rest of the figure remains in proportion, a notable achievement for this most difficult of motifs. Indeed, I rate this tessellation so highly that if pressed to nominate my best example of all, this would be the one that I would select, for reasons of the rarity of motif and the above veracity. However, in an aesthetic sense, there still remains room for improvements, as in retrospect I now regret adding a belt to the figure, albeit this was well intentioned at the time, with the idea being that such an addition would thus add detail. However, by so doing, it effectively ‘distracts', as the figure is thus cut into two distinct parts, and so thus arguably ‘hinders' rather than ‘assists' in the recognition of the tessellation. 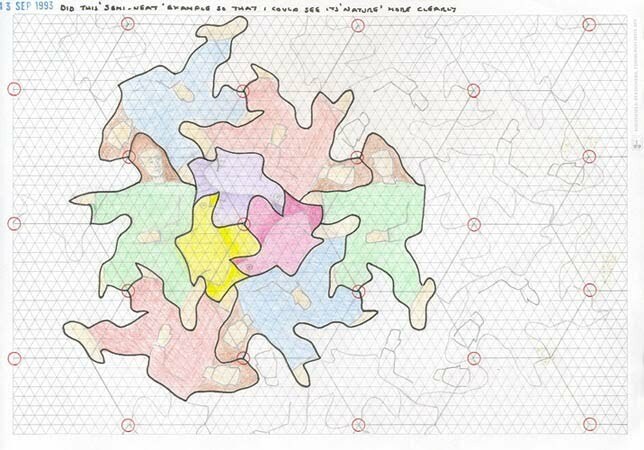 Although this remains a most minor aspect, only by paying appropriate attention to such ‘nuances' is what will essentially ‘elevate' any arbitrary tessellation, hence the necessity for preliminary studies. 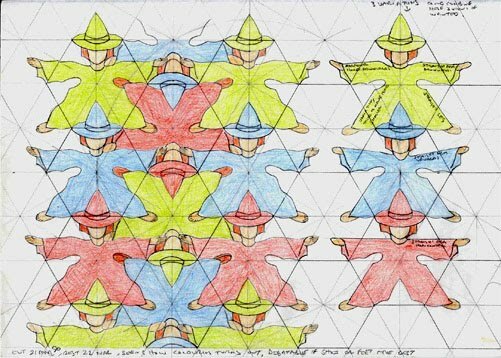 This particular motif can also be found on the polyhedra page, as applied to a kaleidocycle and octahedron, namely with No.1 and 3. A minimum of three colours are required. A basic core of three colours, red, yellow, and blue are used, these being at contrasting points on a colour wheel. The hair is of one colour, although three colours would have been permissible. Such a choice was deliberate, as by having additional colours for this aspect the motif would be less distinct, as alluded to above. As such, this motif should self evidently be seen as of an intrinsically high quality, as ‘proportionally' it is well nigh perfect in this aspect, of which such an achievement is notoriously difficult. Indeed, of all my motifs, and not only of human figures, I rate this particular example most highly, an ‘all-time favourite' of mine. 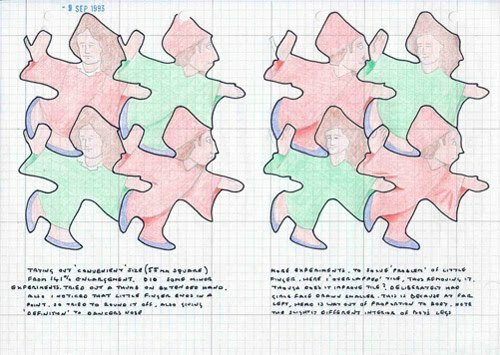 Of interest is the genesis of this, as this shows how easy it can be to compose such quality tessellations. 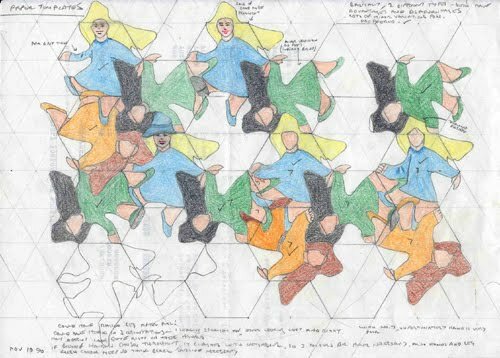 As such, it was as a result of noticing a tessellating diagram apparently devised by Percy MacMahon, shown in New Mathematical Pastimes, page 108. However, although a human-like figure can be seen (at least to my experienced eye), the outline is still most rudimentary, as it possesses no hands or feet, of which the next obvious step is thus to experiment and see if these can thus be introduced successfully. Such possibilities are tried out on the study, from which it can be seen that the addition of such features undoubtedly improves the quality of the initial motif. This aspect of striving for improvements by the process of experiment thus shows the advantage of not simply being satisfied with the initial outline, good as it is. As such, of its genre, this is of a superb example, as the whole figure is in proportion, a feature that is notoriously difficult to achieve. Upon inspection, this example has many points in common with Girl No.1 in respect of its symmetry, these being identical and also in of its outlines, of which despite appearing at first glance to be wholly different due to the wings. 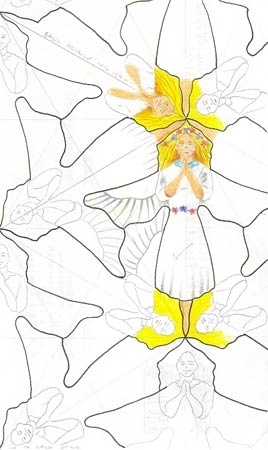 As such, in comparison the arm and sleeve region are now wings, from which this thus essentially ‘frees-up' the arms to be placed in any position, of which as this here is based upon an angel, are duly shown in a prayer position, thus ‘reinforcing' the motif. Seemingly as ever, this is shown despite some reservations as to its inherent quality. As such, the girl's legs are somewhat ill proportioned, and furthermore the head is somewhat larger in scale in comparison to the rest of the body. However, this aside, the figure is really quite good, albeit far from perfection, and so thus duly merits inclusion. Of interest is that this example is instructive concerning a point I make in Essay 1, pertaining to the hair. As can be seen, the hair is of the ‘flowing type' created deliberately so, as on the other side of this is the far more important definition of the body and arm, of which this line was essentially ‘concentrates' upon. Upon inspecting the figures, minor variations abound, all in an attempt at improving the figure, examples of which include a hat, belt and underside view of shoe. 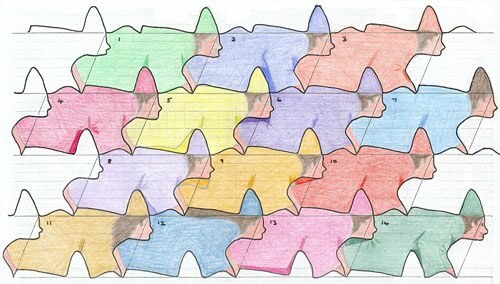 From this, after due consideration, the favoured one(s) can thus be included on the ‘finished' tessellation. Although this example is in with conjunction with a bird motif, I include it here as it primarily concerns the human figure. As such, despite having some reservations about the quality of this example, most notably with the leg region, overall it remains of a broadly acceptable nature, and hence its inclusion. More specifically of the legs, the hind one is somewhat misshaped, with a noticeable kink. Although a foreshortening effect is ‘assumed' for this limb, it nonetheless remains non-ideal. Another drawback is the foot of the leading leg – it seems to be of a somewhat unnatural pose. 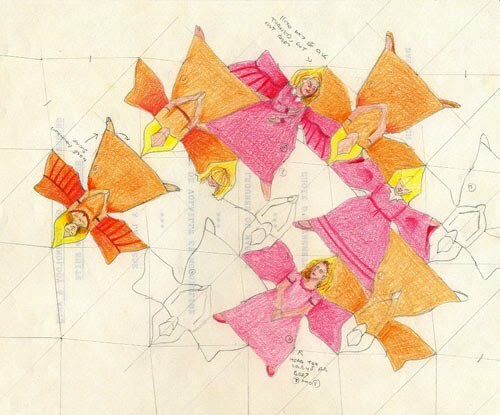 However, as an ideal human figure is so difficult, on occasions such shortcomings essentially have to be accepted as a matter of course, as otherwise, there would be none – Escher included. Such matters aside, this example is interesting as in addition it also contains a bird motif. However, there is nothing significant about this, and indeed is essentially unwanted, and only arose due to circumstances, which of necessity included this motif (the original tessellation consisting of the outline of human figure and the bird). Furthermore, the composition is essentially non-aesthetic, as there is no obvious connection between a running man and a bird. However, although the above has been somewhat derogatory about this in terms of inherent quality (upon reflection perhaps harshly so), it still possesses considerable merits. 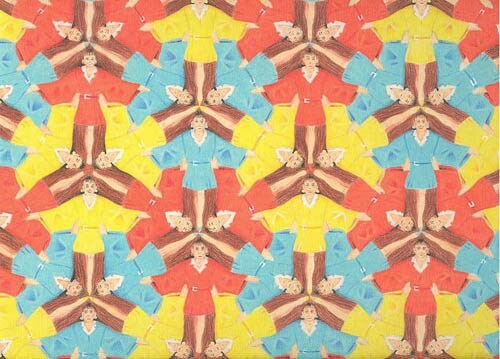 In contrast to most examples of human figures (of which the following also applies to all other tessellators) whereby the figure is generally seen in a upright position, this here adopts a ‘crawling' pose, and so this ‘novelty factor' makes a refreshing change from the usual format, although there is nothing of any importance or significance to this per se. As regards the quality of the figure, this is one of my better ones, albeit with due reservation, as the figure is broadly in proportion (an everlasting concern). As such being a study, due to ‘non-specificality' of the outline the apparel of this figure is left in broadly open-ended state. However, due to the outline and the wearing of a hat, the most appropriate suggestion appears to be ‘night attire', of which pyjamas and a night cap come to mind, thus giving the title of ‘sleepwalker', albeit in a somewhat unnatural (crawling) position. Again, this figure illustrates principles of design as regards the human figure, of which the frequently occurring hat is duly employed. As such, in this instance, it is in a sense ‘optional,' in that it can indeed be dispensed with, albeit the tessellation would noticeably be the poorer for, as on the ‘other' side of the line it defines thigh, body and arm, all of which would be formless, and therefore of a inferior standard without this accessory. As this is shown as a study, numerous minor variations, numbered 1-14 on the figures themselves, can be seen in which I experiment with trying out ‘aspects of improvements,' of a three-dimensional nature, of both limbs instead of one, such as No.3 (arm) and No.5 (leg). As such, this is purely and simply a fantasy figure, with no pretence as to representing any idea or of a specific figure, as for example an angel or devil. Furthermore, the figure itself is most variable, as although predominantly of a winged nature, such a feature can be dispensed with, as the figure can alternatively be normally clad in a dress, albeit with disproportionate sleeves. This figure neatly illustrates several of the points raised in Essay 1, of which I emphasise here. Firstly, the hair can be seen to be ‘pointed' at the vertex, a common situation where the hair is of necessity at this place. Secondly, it also illustrates the variations of head position, with left and right orientations. As can be seen, there is plenty of scope here for variation, all of which have to be examined in depth for aesthetics before making a definitive choice. This is of quite a good quality of motif, as the figure is broadly in proportion, and although I would not say it was amongst my best, it is certainly above an average standard. Again, this example nicely illustrates several of the points I make in Essay 1. As such, this is a typical example of the female being favoured over the male motif, due to the previously mentioned factors of ‘ambiguity of outline' in this case of hair and dress. Such vagaries are both fully used here. Of the dress, this outline defines the legs and upper body of the adjacent tile, of which both have a more specific outline, in contrast to the garment, and so the line is ‘designed' to reflect this importance i.e. biased towards accuracy of the former. This being a study, ‘variations' are tried out, with for example the wearing of a hat and the holding of an ‘unstated object' of sorts, all these are in an attempt at improving upon the motif as regards to its inherent quality. For example, the dress is somewhat strangely shaped (of necessity to accommodate the leg) and so consequently I attempt to alter this shortcoming by changing the interior, giving the girl something to hold in her hand, the above ‘unstated object.' As can be seen, for the left hand side girls, this thus results in a better definition of the dresses outline, albeit now other matters arise, as the ‘unstated object' must now ideally be changed to represent something concrete rather than left remaining ill defined. Such changes or ‘compromises' are of an ever-present concern, of which in effect I vacillate. Another feature is the near ubiquitous possibility of the hat, this being employed in an attempt at disguising a unnatural ‘protuberance' of the hair, albeit in this example such matters are not of an overriding concern due to the generally realistic appearance of the hair. As such, all these matters must therefore be taken into account and addressed before the definitive choice as to what is ‘best' is made. In general terms the girls on the right hand side are favoured, as upon due reflection the ‘unstated object' idea is presently unresolved, and thereby the holding of this is thus somewhat of a contrived nature. Such matters aside, the girls here resemble an ‘Alice in Wonderland' type of figure, of which due to such association would therefore make a most pleasing, purposeful composition. 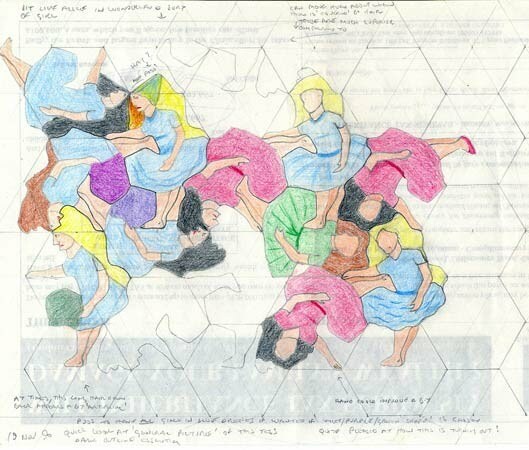 However, as Alice is portrayed with blonde hair, such colouration is on this occasion incompatible due to the figures symmetry, as the hair of the three orientations of the girls all meet, thus of necessity forcing different colours. However, on occasions such a rule can indeed be broken, and in this example, for the excellent compositional possibilities that arise, such a breaking, is, I feel, would be fully justifiable. Firstly, although in some aspects the figure(s) here are slightly, if not noticeably out of proportion, this example still has many redeeming features, and so therefore, upon due consideration, I consider that it thus fully justifies its inclusion. Now, as such the basic outline has the rare feature that two distinct human figures are possible, of both male and female, and of completely different views or poses, and are not mere minor variations of the same basic theme. However, the qualities of the respective motifs are of different standards, with the female noticeably ill proportioned in comparison to the male. Indeed, so poor is the female figure that it is debatable as to whether this is of a sufficient quality to show, bearing in mind the text above admonishing such poor examples. This matter aside for now, in contrast the male figure is of a decidedly superior nature, of which, although it is somewhat squat, is obviously far more in proportion, and is certainly more than worthy of inclusion. Obviously, as there are two distinct motifs for a single outline, this thereby opens up possibilities for these in combination, essentially as shown below. However, due to the disparate qualities of the motifs, it is debatable whether in an aesthetic sense such a composition should be proceeded with.